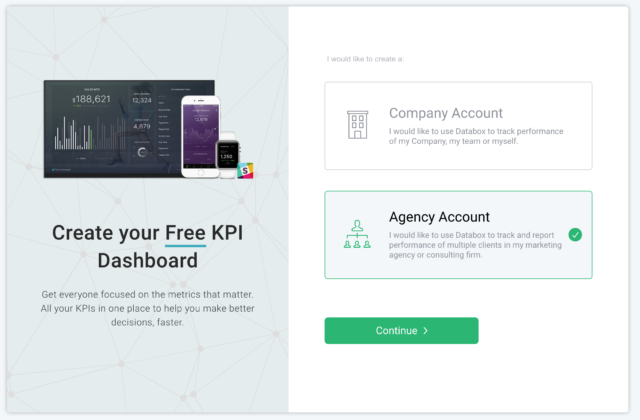 Agencies usually sign up for a Databox agency account because they want to stop spending a ridiculous amount of time compiling client reports on a monthly basis. Some agencies also want to become more agile by optimizing client results on a daily or even hourly basis. Or, they want to put their hard-earned results in front of clients more consistently. Over the last six months at Databox, we’ve obsessed over helping agencies do all of that. Based on feedback from our inaugural partners, our product team has streamlined our app so agencies can automate their entire reporting workflow. They can do this in less time than it usually takes to manually create monthly reports for one client. Here are the first 5 things you should do to eliminate cutting and pasting forever. Once you create your own agency account, you can quickly create client accounts under yours. This allows you to manage your client’s account for them or manage it alongside them, if they want to be more involved. It ensures you never accidentally share one client’s data with another. You can also leverage mobile alerts and notifications to report successes to each client as they happen. This step couldn’t be easier! All you have to do is click “add new accounts” here. Here are full client account creation instructions if you want to read them. Or just watch the animated gif below to see the full process. Step one… complete! Think of your agency account as a research and development area where you create templates and reports that can be rolled out to client accounts. Reports created in a parent agency account can be transferred to the child client account. So, you can create standard templates within your agency account and re-use them with every client. On our free plan, we pull data once per day. On our other plans, we pull data hourly. 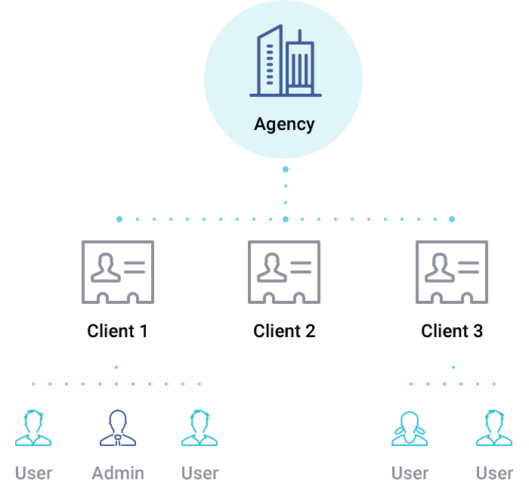 Because each of your client accounts is separate, you will need to connect data sources inside each client account or inside your agency account. Agencies use Databox to easily view data from multiple software systems in the format and flow they desire. With most other business intelligence tools, you must design every report from scratch. At Databox, we think that’s pretty silly. The software we all use — especially SaaS — have codified which metrics we should all be tracking. For example, Google Analytics has standardized metrics like sessions, users and pageviews, while HubSpot has popularized concepts like Marketing Qualified Leads and Opportunities. 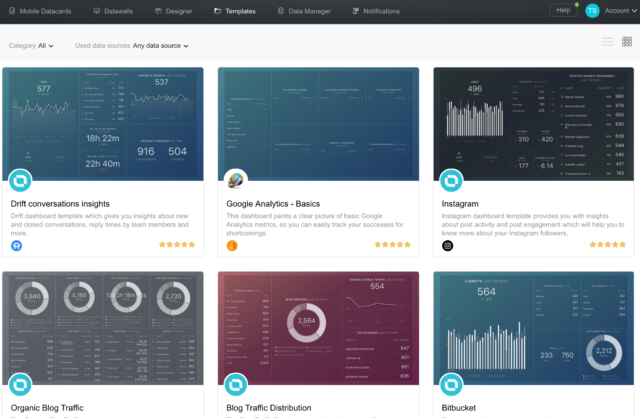 At Databox, we take the time to understand the metrics from each of our integrated apps, pull them in via our native connectors and instantly visualize them in our template directory. For example, we pull 138+ metrics from HubSpot alone and have created 30+ HubSpot templates. This way, you don’t have to re-invent the wheel. The report template directory helps you setup your initial client reports within minutes. In the template directory you can quickly choose from a list of 100+ pre-made Databoards that pull the metrics important to you or your client. Some also use the template directory to find inspiration for advanced reporting options they hadn’t thought of themselves already. Even if you start with a template, you can still use our Report Designer tool to make tweaks to it. As a bonus, partners who come up with a brilliant report can submit it to be included as a template in our directory, complete with your branding. For example, Stream Creative’s SEMRush Keyword Ranking Report is one of our most popular. After your reports are set up at the agency level, send them into your client accounts in one click. Once you send Databoards to the appropriate client, toggle into the client’s account to accept the Databoard and connect the appropriate data sources. The report will then be populated with your client’s metrics. As an aside, it’s important to note that while you can send templates from the agency level to client accounts, this does not work both ways. In other words, if you create a template in the client account, it can’t be sent up the tree to the agency. By following this report cloning process, you can pick and choose which clients receive which reports. There are many reasons to vary your reporting from client to client. The marketing sophistication of your clients might vary. Sometimes, you might be working directly with a business owner or CEO who might care a lot less than an in-house marketer about specific details on each individual marketing tactic or campaign. CEOs may just be interested in high-level performance metrics like traffic, leads and sales. But, in-house marketers may want detailed reports on performance of each marketing channel. Clients use different software. Some clients might use MailChimp, while some might use HubSpot or Campaign Monitor. Different levels of reporting create opportunities for agencies to charge for their reporting capabilities. You can develop more advanced views to help with finance or sales reporting, for example, or do deep dives on SEO using SEMRush and Google Analytics data for clients who are invested heavily in content marketing. Then, you can charge clients for the effort of creating and interpreting the health of their entire business, as well as the success of your marketing services. Here’s an agency that’s offering reporting-as-a-service. If you run into scenarios like these, it’s critical for you to automate your reporting. If you do your reporting manually, it’s almost impossible to vary reporting client by client. One person cannot easily keep track of different reporting needs across multiple clients, especially as the reporting needs change over time. But, when you’re automating the data pulling process, this kind of variation becomes easy. To customize the look and feel of the reports, go to the top panel of the designer and change the visual settings. You can alter the background color to match their branding, or add a watermark image to denote the type of data you’re presenting on that particular report, add their logo, and customize the text describing each report. Some agencies stop here. Instead of cutting and pasting data from multiple systems with different formatting into a Powerpoint, they cut and paste Databoards into Powerpoint instead. They rationalize that some clients would be more confused or more demanding if they had access to real-time data. But, if you’re ready to take the transparency plunge by sharing real-time reports with clients, you can set up each client’s reports in a continuous presentation cycle. To do this, adjust the streaming carousel settings to create a sequence of Databoard reports. Looping or sequencing databoards is a great way to steer the conversation with clients even when you’re not there when they’re viewing the data OR tell the right story while presenting the data live, similar to the way you might use a Powerpoint presentation. For example, you might show a report with high-level marketing funnel metrics like social media followers, website visitors, leads, deals and revenue. Then, you could have a second report that does a deeper dive on the performance of your social media posts, a third report showing traffic by source, a fourth report, and so on. As they click through the reports on their own or listen to your live presentation, you can tell the right narrative. If you are accustomed to using Powerpoints where you manually add explanations, interpretation and recommendations, consider using our Notes feature instead. If you can get your clients to monitor the data and read your notes on their own, you can then turn your monthly check-in meeting into a conversation about what’s next, not a conversation about why things did or didn’t work. Once you set up a carousel, send your clients the streaming URL so they can bookmark it and check it anytime. (If you want that URL to be a subdomain of theirs, we can do that too, at no extra cost.) With the URL, they will have the ability to view up-to-date data. But, unless you want them to, they cannot access the Designer and make any changes to the Databoards. However, if you make changes, they will be reflected in the streaming URL (e.g. you won’t need to send out an updated link). If you really want the stellar results you’re producing to stay front and center, tell them to download the mobile app. With no additional setup required on your part, they will be able to access their data on their phone. And if you want to get really fancy, set them up to view their KPI reports on a TV in their office or home, connect their Slack account and buy them an Apple Watch so they can view the data on their wrist too. With these simple five steps, you can save your agency hours of cutting-and-pasting hell each month. With the saved time, you can either make your engagements more profitable or spend more time moving the client’s needle. and leverage our template directory and your analytics prowess to quickly identify new insights and make the case for additional services. After all, the main reason you’re doing reporting is to retain and grow your accounts. Let us help you do that. Sign up here if you haven’t already. If you get stuck, view our help documents or contact our support team. We’re here to help. Today we’re rolling out new ways to provide more value to you, our partners, through new and exciting co-marketing opportunities.